Trust those special projects to DMT® Diamond Honing Cones. 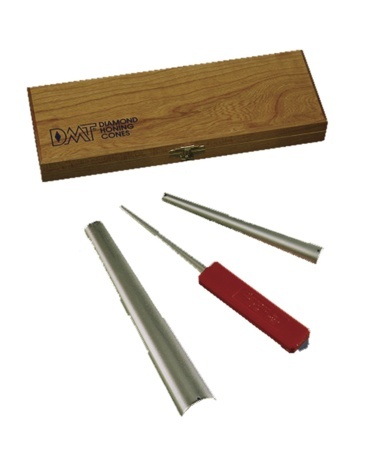 The tapered diamond slip stones are excellent for working gouges, wood turning, tool & die work, dental tools and more! This kit of three comes in a beautiful hardwood storage case. All three are fine diamond (25 micron / 600 mesh) for a razor sharp edge. Sharpening with diamonds is fast and easy. No messy oils needed, simply sharpen dry or with water. Durable construction will provide years of consistent performance and reliable service. For proper tool maintenance, woodworkers, chefs and other professionals rely on the superior quality and versatility of DMT® products. Made in USA.